Growing copper sulfate crystals science project. 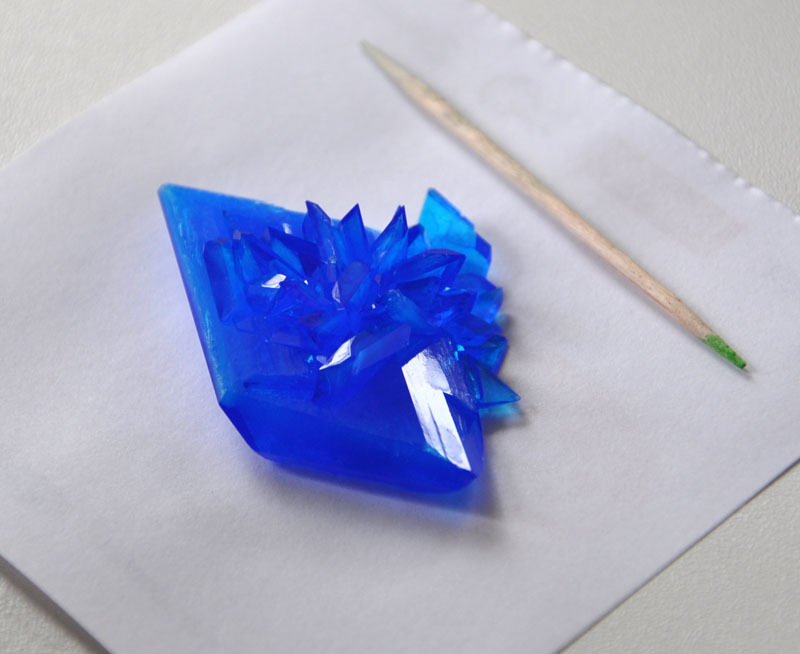 The goal of the project is to grow single crystal of copper sulfate as big and perfect as possible. 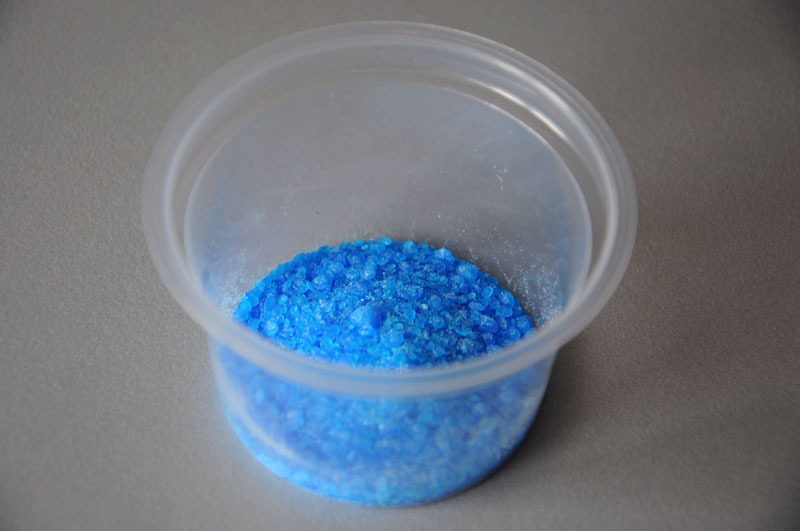 Fortunately, copper sulfate produce mono crystals very easily, so it should not be too hard. Also it's one of the prettiest crystals you can grow at home. Copper sulfate is common household chemical used to fight mold, fungi and algae in gardening and in the ponds. It's easy to find it in the nearest garden shop. It's sold either as light blue powder or as blue irregular crystals. Handle it with care, it's toxic and has an absolutely terrible taste. Always wash your hands thoroughly after you get in contact with it. Use only disposable tableware for this project. two 200-300ml new plastic containers (or glass jars). Note that bottom of the container should be flat and container should be able to resist hot water! Saturated solution - is a solution of a substance that can not dissolve this substance any more (imagine you ate so many cookies - you're stuffed and can not even see them any more - so you're saturated with cookies). For some substances saturation highly depends on temperature of the solution, and the rule here is that the hotter the water the more substance can be dissolved. Copper sulfate is one of such substances. At 15oC (59oF) it's possible to dissolve 30g of copper sulfate in 100 ml of water, while at 70oC (158oF) 70g of it will dissolve in the same amount of water. Which means that if you dissolve 70g of copper sulfate in hot water and cool down this water to 15oC (59oF) 40g of it will form the crystals! Let's take 100ml of hot water (be careful!) and pour it in the clean container. Put the container in the larger bowl also filled in hot water - with this hot bath we prevent our solution from cooling down too fast. 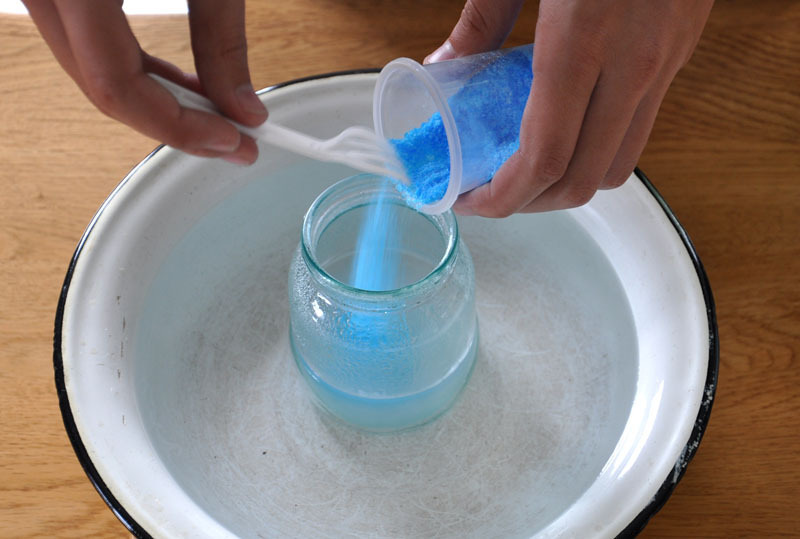 Add couple of teaspoons of copper sulfate in the water and stir it with plastic spoon until all crystals are dissolved, add more copper sulfate and repeat until crystals stop dissolving in the water. This means that our solution is now saturated. Now we should leave it for 10 minutes on the hot bath, to let all the remaining micro crystals, grains of dust and sand that can be in the solution sink to the bottom of the container. 10 minutes later take the second clean container and very carefully pour half of the solution from first container to the second. Make sure that no crystals or other sediments from the first container made it to the second. Cover second container with piece of paper, put the container in safe place(avoid shaking, and sudden temperature change). After 10-30 minutes multiple tiny crystals should start forming. This will be our SEED crystals. 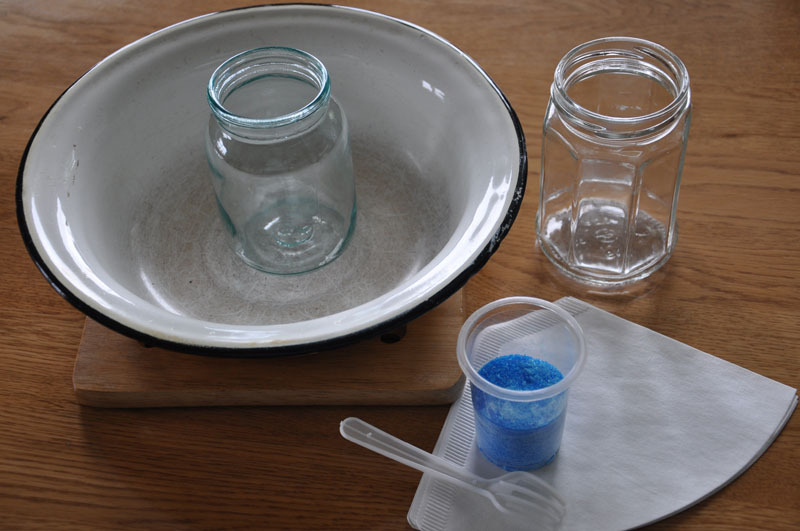 Timing of seed crystals growth depends on the initial temperature of your saturated solution, temperature in the place where you left container and how pure were copper sulfate and the water you used. Check the bottom of the container every 15-20 minutes. As soon as seed crystals will grow to 1-2 mm size, pour most of the solution to the first container. Collect seed crystals and put them on the paper towel to dry. Avoid touching crystals with your hands, you can use toothpick or plastic teaspoon to separate them and sort them. The crystals should be of blue - light blue or dark blue color, depending on their size. They will be transparent parallelepipeds with perfectly straight edges and flat faces. Choose 2-3 most perfect crystals as your seed crystals. We need a seed crystal to make cristallisation center for growing bigger crystal. If you don't put proper crystallisation center into solution, crystals will form on any speck of dust or air bubble. This way you have a chance to get a bunch of crystals, has grown into each other. Hooray, first part of the project is done! Also, it's the easiest part. Let's do the rest. First we'll need to prepare larger volume of copper sulfate saturated solution about 200-300ml of it. You make it the same way as for seed crystals. It's good idea to use purified water or distilled water for this procedure. The cleaner water you use the less chances that there will be other centers of crystallization in solution besides your seed crystal. 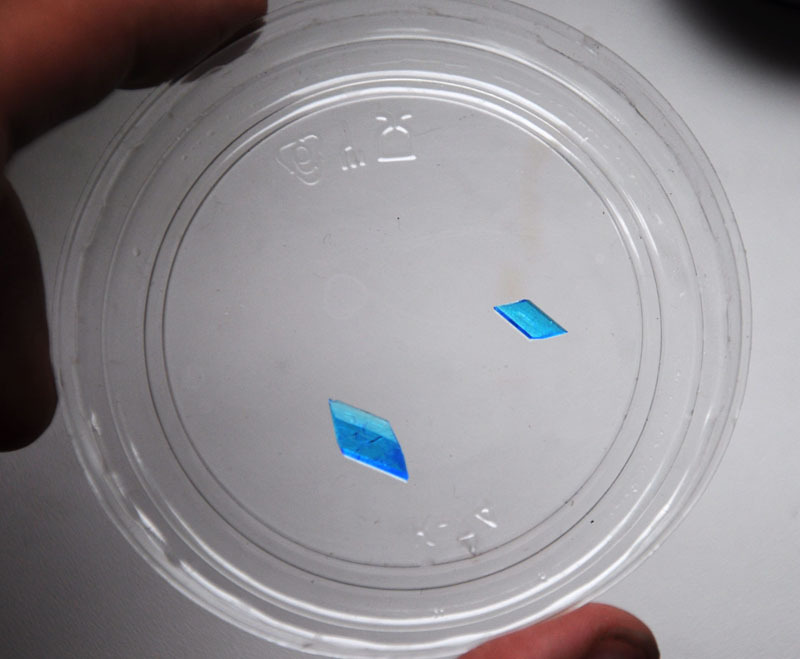 There are two possible ways of growing copper sulfate crystal - cooling crystallization and evaporative crystallization. Cooling crystallization will allow you to get results within 24 hours, but there are chances that your crystal will grow irregular or multiple crystals will form and grow into each other. With evaporative crystallization you'll need to wait for a week or even few weeks for crystal to grow, but if done properly, this method should produce better formed crystals. For the fast method you use hot water to prepare saturated solution in first container, which you put in the larger container or bowl, filled with the hot water to prevent fast cooling. Let it stay for 20-30 minutes and pour approximately 70% of it's volume in the second container. You put second container in the same bowl with hot water to ensure that solution will be cooling down as slow as possible. Now put your seed crystal on the bottom of this container. Cover it with filter paper or lid to prevent from dust particles. In theory, if solution is chemically clean and does not contain sand, dust, or other microscopic compounds the crystallization will be happening only on the surface of the seed crystal. In practice you should check your container every few hours to see how things are going. After 5-6 hours when temperature of the container will be equal the room temperature your crystal grows will slow down. For the slow method you make saturated solution in the cold water, let it stay for 1-2 hours to make sure that all particles sink to the bottom, and carefully pour 70% of solution in second container. Put seed crystal in it. Now cover container with cloth or filter paper and put it somewhere in the house where temperature is the most stable. 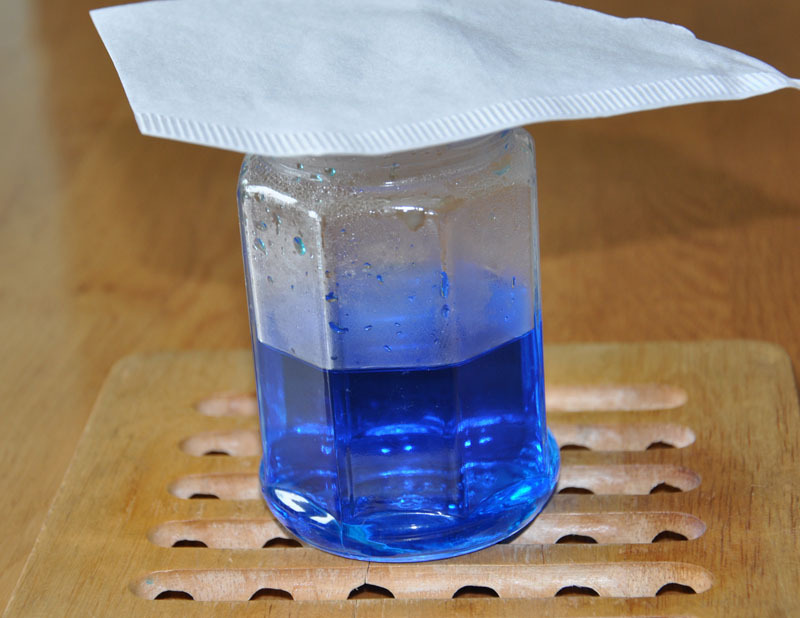 As water will evaporate from the container more and more copper sulfate will deposit on the seed crystal. The process will take few days or even weeks - depending on the temperature and moisture of the room, but the quality of the crystal probably will be better than with first method. You can check them both and see which one works better. 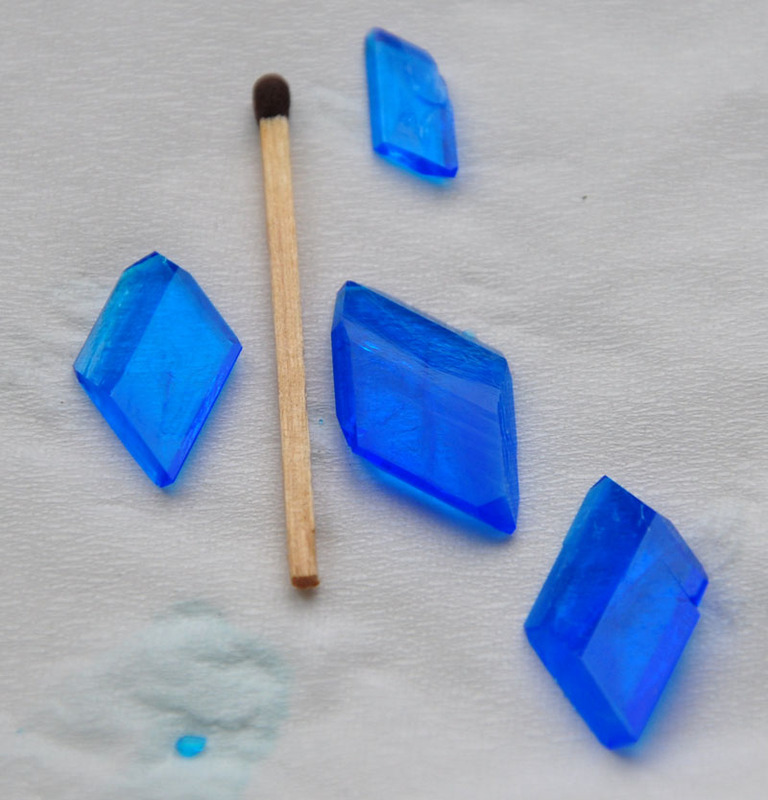 Now you should have single beautiful crystal of copper sulfate. Remove it from container and dry with paper towel. Unfortunately the surface of a crystal dehydrates after a while, and it will lose its glossiness. You may want to cover it's surface with clear nail polish to prevent dehydration and make it safer to touch. Good luck.